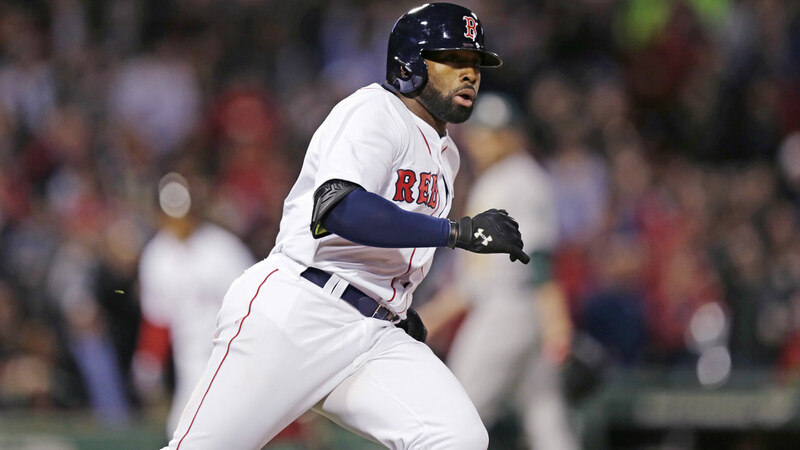 BOSTON -- Jackie Bradley Jr. extended his career-high hitting streak to 15 games with a two-run single in Boston's six-run fourth and added a grand slam two innings later, carrying the Red Sox over the struggling Oakland Athletics 14-7 on Monday night. Josh Reddick's club-record streak of hits in eight consecutive at-bats was stopped when he grounded out his first time up. Travis Shaw's RBI double and Bradley Jr's single tied it, and Mookie Betts doubled in the go-ahead run. Dustin Pedroia's run-scoring single made it 6-4, and Ortiz capped the rally with an RBI double against Fernando Rodriguez. Holt homered in Oakland's bullpen the next inning, and Bradley hit his slam over a short wall in deep right. Davis' homer landed into the first row of Monster seats.